It’s a fact. Some traditions, including wedding traditions, are funny, and strange. This list of 5 Quirky Wedding Facts is just the tip of the iceberg! If you’ve ever dreamed about saying “I Do”, than you have probably thought about your wedding day. You’ve thought of all of the details. You have visualized the ceremony, the wedding dress (of course the wedding dress! ), what your colors will be, what your bridesmaids will wear… the list goes on! But as you plan out all of the details, have you ever wondered why they might be a part of the ceremony? Why does the bride wear a white dress? What’s the reason for a garter toss? Why do brides have bridesmaids, and why do brides carry bouquets? Here are 5 quirky weddings facts that will leave you saying “Aggh-hah” when you are planning for your “I-Do’s”. Why Do Couples Wear Wedding Rings? The first wedding rings can be traced back to ancient Egypt. Ancient Egyptians believed that the unbroken circle symbolized perpetual love. Today’s custom of wearing wedding rings dates back to ancient Rome and Greece. These cultures associated the rings with fidelity, and as a part of the bride’s dowry. Although we no longer have dowries when we get married, wedding bands are still almost always made of a precious metal. The use of the precious metal is meant to symbolize the permanence of the marriage vows. They are made from metals known as “noble metals” because the metals are rare, and valuable. This is especially poignant, as finding the right partner in life is rare and precious as well! In the United States, it wasn’t until the 20th century that men started wearing wedding rings as well. Prior to that, only the women wore wedding rings. Quirky Wedding Facts – Did you know that once the ring is placed on the finger in church, it is considered unlucky to remove it? 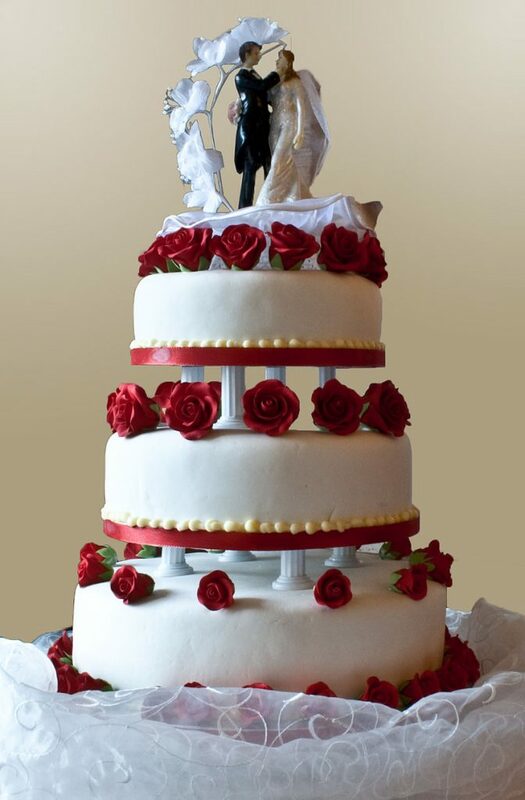 Saving the top tier of the wedding cake was originally meant to celebrate the announcement of the birth of a baby! Why Are Bridal Gowns So Fancy? Since the Middle Ages, brides have worn wedding dresses to symbolize the union of two people, and the joining of two families as one. Remember – marriages were not always based on love! In fact, it was usually the opposite. Marriages were brought about to unite families for business reasons, political reasons, or class. Both the bride and groom’s families were expected to bring their best attributes to the union. For this reason, a bride’s dress became a symbol how much wealth her family would bring to the marriage. Wedding dresses were usually made of exquisite materials, and trimmed with furs or velvets. Bold colors were used, and no expense was spared. Quirky Wedding Facts – Did you know that it was not until after an English Royal’s wedding that white dresses became popular in America? In 1840, Queen Victoria was married to Prince Albert. She chose to wear a white lace gown, and brides, after seeing the royal’s example, adopted the trend. There are many thoughts as to the origins of bridesmaids. Few can agree when the actual tradition started. However, we know that in Ancient Rome, 10 witnesses were required to watch a wedding, for the wedding to be considered legally binding. This tradition may date back even earlier however, as the Bible contains scripture about having maids as attendants. Quirky Wedding Facts – Historically, being a bridesmaid was considered a good way to land a husband! But, if you had been a bridesmaid more than three times, and were not married – watch out. Evil spirits had cursed you. But don’t worry – it was believed that to break the curse, you would just have to be a bridesmaid four more times, for a total of seven weddings. And then get married, of course! Sounds like the plot from one of our all time favorite movies, 27 Dresses! Why Does A Bride Carry A Bouquet? We can thank the Ancient Greeks for this tradition as well – are you sensing a reoccurring theme here? Greek Mythology told of the Goddess Eris tossing a golden apple into the wedding feast of Peleus and Thetis. (Also known as the Golden Apple of Discord) This apple was considered to be a prize, and would grant the lucky recipient beauty. The Greek people carried out this tradition in wedding ceremonies by carrying clusters of herbs and spices, thought to have magical powers. The Bride’s bundle would be tossed into the audience, much as we toss the bouquet still today. Quirky Wedding Facts – No one knows why we know believe that the person who catches the bouquet will be the next in line to be married. The origin of this myth is unknown. Why Does The Married Couple Save The Top Layer Of Their Wedding Cake? Every Bride and Groom have been told they need to save the top layer of their wedding cake after the big day. Today, Bakers will tell you that it is so the first later may be pulled out of the freezer on the one year anniversary of your wedding, to celebrate your nuptials. But did you know that was not actually how this tradition started? Originally, the wedding cake layer was saved, so that it may be pulled out within a year to celebrate the announcement or birth of the couple’s first child! That’s right – no pressure, but back in the day it was expected that the happy couple would be also be new parents in less than one year’s time. That’s a whole lot of pressure for a sumptuous baked confection! Quirky Wedding Facts – The rhyme “First comes love, then comes marriage, then comes baby in a baby carriage” also refers to the belief that a newly married couple would have a baby in one year’s time. So there you have it…five quirky wedding facts about wedding traditions that we still celebrate today! We hope you have enjoyed it, and that you look forward to our next blog installment, where we celebrate all things wedding and prom!